This is Alexander Pope's translation of "The Iliad" into heroic couplets. Homer's tale of the Trojan war is a compassionate view of human life lived under the shadow of suffering and death in the face of an overwhelming and often uncaring divinity. 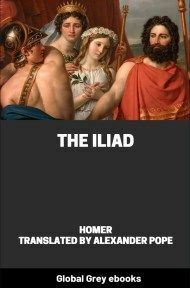 I also have a Global Grey edition of 'The Iliad' in PDF, epub and Kindle ebook formats, translated by Samuel Butler, which can be found here.